What’s the difference between Chess King and Chess King Pro? The main difference is that the engine that powers Chess King is Houdini 2 Pro. That’s a fundamental difference. For “normally powered” PC’s with 1 or 2 cores, Chess King (with Houdini 2) should be fine and will manage all classical chess tasks just fine using just one processor. But for powerful PC’s that have multiple cores, Houdini 2 Pro will take full advantage of all the cores and will make the analysis super fast and a tiny bit more powerful. Another difference is that Houdini 2 Pro handles play and deep engine analysis of Chess960 games, including correct castling, whereas Chess960 play and engine analysis is not supported with Chess King Standard. In addition, Chess King Pro includes an extra 685 MB file which is called giga_eval_setup.exe and adds a large opening tree with all evaluations pre-computed to save time. Chess King shows all the opening trees fully but without the evaluations. Houdini 2 Pro also allows you to control entirely the engine settings, including the hash and personalities. You can also attach the Nalimov Endgame TableBases to Houdini 2 Pro which is included in Chess King Pro. 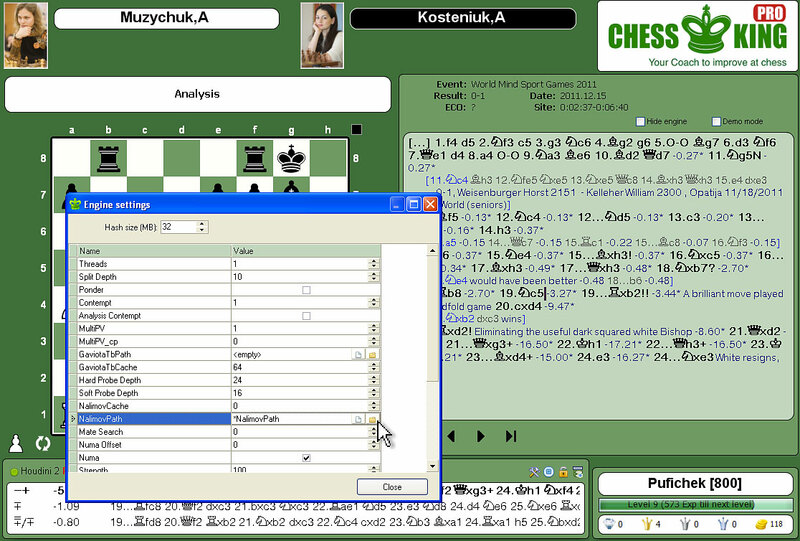 See a screenshot of the engine settings from Chess King Pro. You can upgrade anytime to Chess King Pro.